The Mack Laing Conservation Committee just submitted their report. 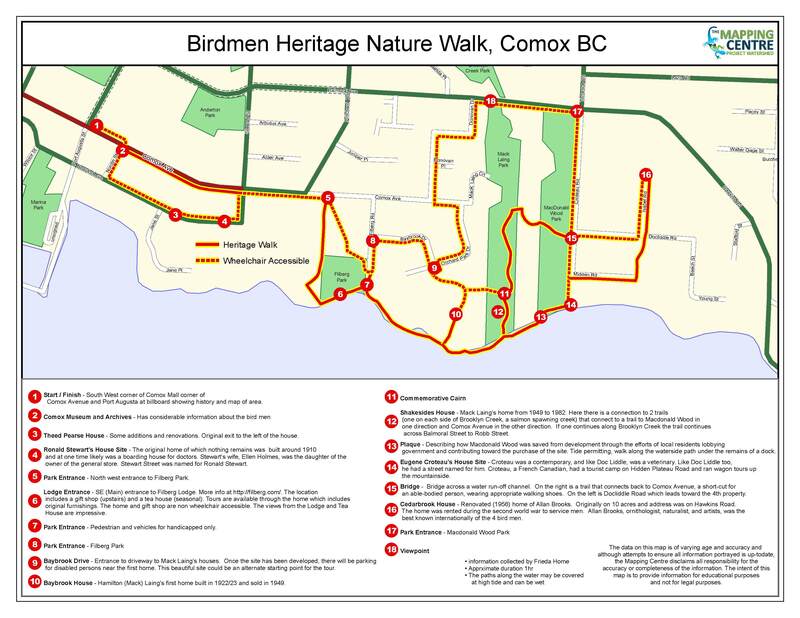 This is a report co chaired by Comox Valley Naturalists and Project Watershed to provide the Town of Comox with a plan to develop the original Mack Laing home, Baybook into a Conservation and Nature Centre. Please note that a presentation will be made to Comox Council on October 9 at approx 5 pm. As part of this report Project Watershed’s Mapping Centre produced a map from information provided by Frieda Home. The map (below) is a walking tour of the area that highlights historical sites of interest. An excellent analysis of the entire issue was expressed by Loys Maingon in a letter to the editor appearing in the August 9 issue of the Comox Valley Record. Click to read Paul Horgen’s letter to the Editor as published in the October 7 issue Comox Valley Record.